Pomegranates are funny. I wonder about how people ever came to eat them in the first place. 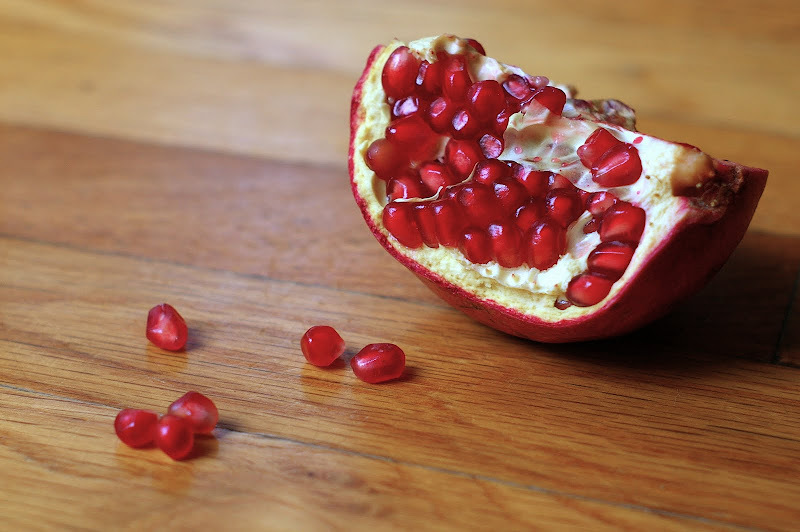 Distilled into beverages, they seem to be everywhere these days, from pomegranate juice to pomtinis. I didn't realize this until now, but pomegranate is the flavor of grenadine syrup. Which, being a Shirley Temple drinker from way back, I have always enjoyed. Don't they just photograph perfectly - those little bits of fruit. I must admit I'm big Pom fan! Love the photo! I have never eaten one of these before. I see them at the grocery store, just never got around to eating one. I think they got big into making em into juice because eating them the normal way is way so freaking messy.